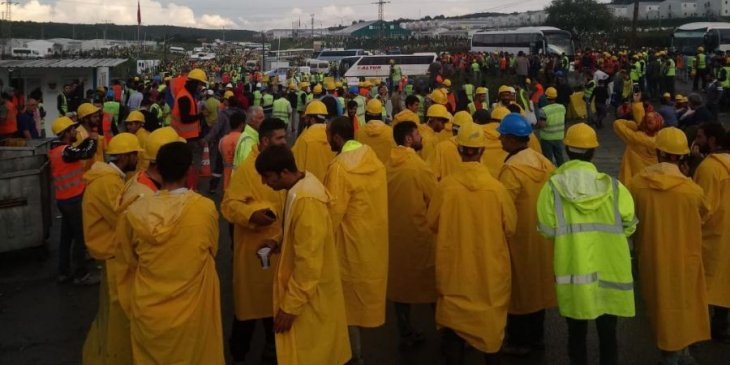 Construction workers employed to build Istanbul’s giant new airport have laid down their tools and called a strike to protest lethal working conditions, Turkish news site T24 reported on Friday. “Our members have downed their tools because of the series of back-to-back workplace fatalities and accidents and the steadily worsening work conditions at the building site of the third airport,” the construction union İnşaat-İş announced in a tweet on Friday morning. Contractors are rushing to complete work on the section of the airport by the date scheduled to open in October this year, though work could continue on the airport, which is planned to be the world’s largest, until 2030. However, reports from the building site paint an image of shockingly negligent management. Workers interviewed by Turkish secularist newspaper Cumhuriyet said workers had died on the site on an alarmingly frequent basis, besides a very high rate of accidents and injuries. A report released in February said 400 workers had been killed on the site, though the Turkish labour ministry responded that the number was actually 27. A worker interviewed by Turkish left-wing news site Evrensel said the strike had been triggered by an accident on Wednesday that left 17 injured, after two more were severely hurt after falling from a roof earlier in the week. However, the workers have been plagued by a host of underlying problems, including difficulties collecting their salaries, being stranded on the building site during holidays, not being fed, and being forced to sleep in vermin-ridden dorms, he said. Workers also told Cumhuriyet they have been forced to work under miserable conditions, being forced to wait out in poor weather and to stay in cheap, bed bug and flea-ridden accommodation. The union released a list of demands as their strike commenced on Friday. These included a call for proper precautions to be taken against workplace fatalities, payments to be made to workers who had not received wages for six months, and for facilities on the site to be properly cleaned and deloused. The list included a demand for salaries to be paid into workers’ accounts, and not in cash. Cash payments are often made to workers so that employers can avoid contributing their proper share of social security payments. The workers also demanded that medical staff at the site clinic correct their behaviour, which they called demeaning, arrogant and neglectful. As the strike progressed on Friday, Twitter posts by İnşaat-İş showed a stiff resistance to these demands by the site management and police. “Colleagues and union members seen shooting videos have been told they will be picked out one by one and punished,” said one tweet. Gendarmerie officers arrived at the site to tell the workers their strike was illegal and demand they disperse at around 9:30 a.m., shortly after which security forces intervened on the workers’ action with tear gas. Police arrived at one of the camps with water cannons and police vans at around midday, and several striking workers have reportedly been detained. The police interventions did little to deter the workers, however, who were still gathered in force at the construction site after 8 p.m. on Friday. Jandarma, 3. havalimanında eylem yapan işçilere biber gazıyla müdahale etti! "İşçiyiz haklıyız söke söke alırız"